Beginning to follow our 2017 roadmap, today we’re releasing a new update to Brix, both for the Brix Lite and premium versions. 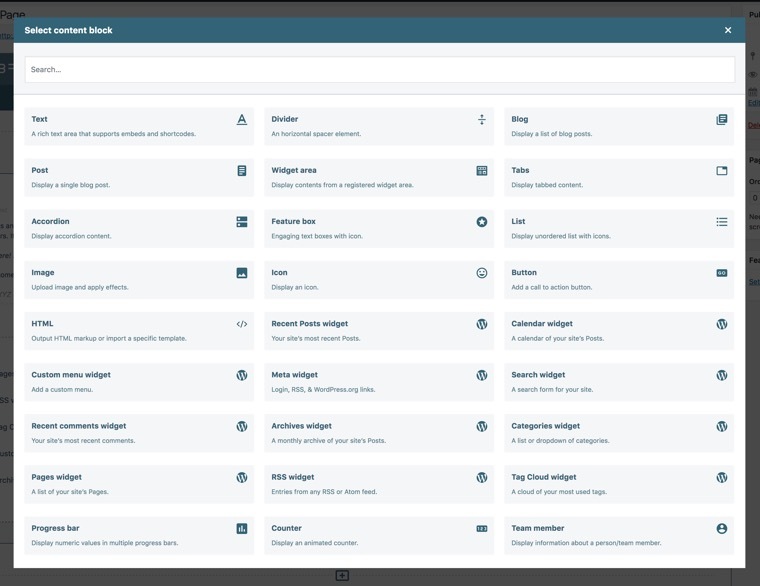 The update sets Brix’s current version to 1.2.5 and introduces the ability to use the WordPress standard widgets as Brix content blocks, effectively adding 11 new ones to the mix, bringing up the total count to 27 for the plugin’s premium version, and to 23 for the Lite version. Adding widgets makes your content shine even more with virtually no hassle: the output of widget content blocks is exactly the same as the usual widget we’re all familiar with, but opens a whole new array of possibilities in terms of effective content creation. Keep following Brix developments though! This is just the first step in better integrating Brix with the many and great tools available in the vast WordPress ecosystem. Next on the list will be the integration with Jetpacks’ wigets, and then adding support for other popular plugins, such as WooCommerce. As always, go play with widgets on our live demo and follow us on Facebook and Twitter for updates and promotions.